Was Socrates Surprised by Negative Rates? QUESTION: Will you have to change your/Socrates opinion due to this extraordinary step? I please you to give as an idea, as Socrates seems to be currently not updated. While this is the first time a central bank has created an “official” negative interest rate, it is not the first time in history that interest rates have gone negative in the free markets. They have done so when capital concentrates and tends to hide. It effectively is paying someone to hold your money safely or there is such a concentration of capital people are unwilling to borrow or invest. Banks began simply as a depository. Only AFTER “merchants” began storing money for a fee (negative rates) did they discover that they could lend money at a fee to someone else and giro banking was born. A giro bank is where money changes hands between two people but the money does not leave the bank. 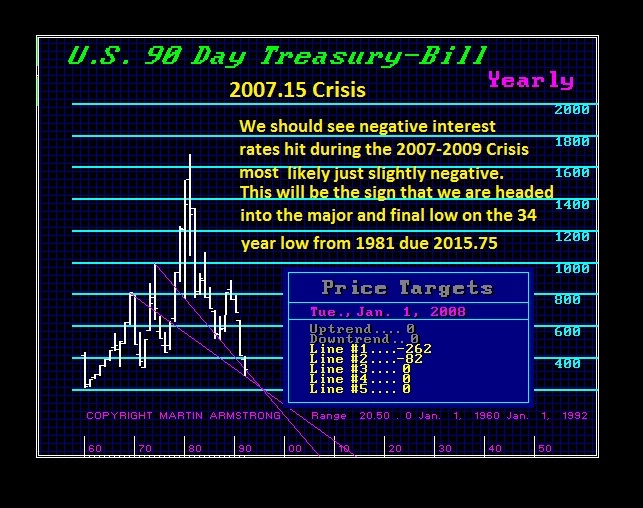 Above is our 1992 forecast calling for such negative rates to hit in the free markets with the crisis starting from 2007.15. However, the second part of that forecast calls for the low in such rates being NEGATIVE by the conclusion of the 34 year cycle from the 1981 high. That will be guess when! You got it – 2015.75. This is why we previously forecast that the Sovereign Debt Crisis should start its Big Bang when this cycle turns. This is a slide a client saved from our 1998 World Economic Conference. So was Socrates surprised? No. 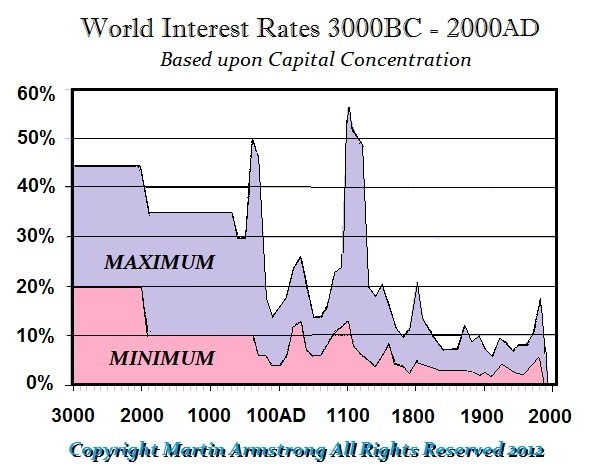 Interest rates began as negative. You pay merchants to hold your money because they have security and hence rates were negative. Rates fall as capital concentrates. In 1981, the fear was the US would default. Gold ran up to $875 in 1980 and rates kept going into March 1981. Rates fell sharply as capital was then attracted to the USA. This ECB negative interest rate is historical from a central bank that has emerged really in the 18th century and did not exist previously. There were clearing banks like the Temple in Delos, but they were not used to stimulate the economy by government. 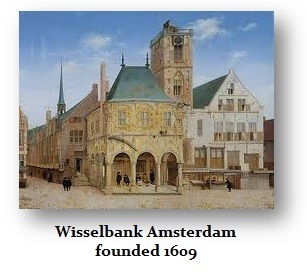 The first government bank, Wisselbank founded in 1609, went bust when people discovered they were paying for storage (negative rates) and here the bank was lending the money to its own enterprises – oops! It was the Wisselbank that was the model for the first central bank – the Bank of England in 1689. No doubt the skeptic will come up and say ya. Where did this 34 year cycle come from? That is 4 times 8.6 and it tends to be dominant in financial markets rather than commodities for the cycle duration is longer. There were even 34 months for the cycle of the crash 1929 to 1932. Don’t forget – this is fractal. I keep saying that everything is connected. Do not judge what I say as my opinion against someone else. I am not on that personal soap box. ABSOLUTELY everything is connected. 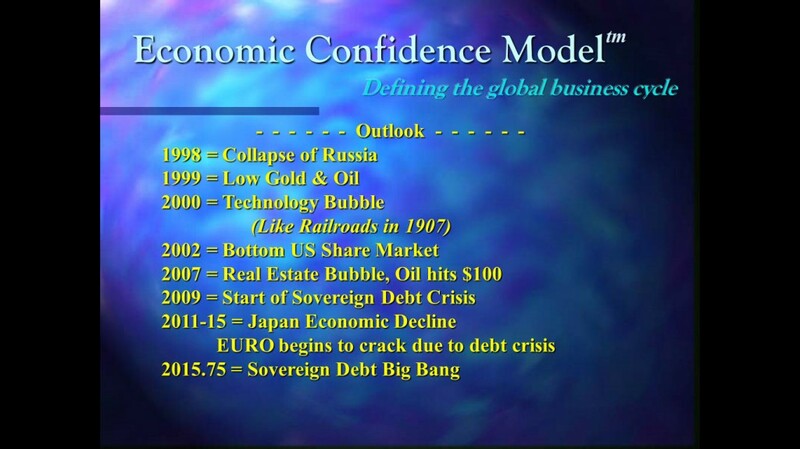 Gold had to decline, interest rates had to go to negative, sovereign debts had to crack causing capital to concentrate, the dollar had to recover, and the war cycle had to turn and the banking cycle on proprietary trading 31.4 years had to start to turn. All of these things are just a tiny fraction of the global correlation of how everything functions. I could care less what someone’s opinion might be. Personal opinions are not worth much these days – that includes mine. This is orchestrated like a ballet. Everything is timed and set in motion to produce the wave of Creative Destruction. The old saying – you can lead a horse to water, but you cannot make him drink. Those that keep trying to turn this into a personal contest have missed the boat. They will never see the whole and are still barking at a tree lost in the middle of a forest.